focusing on architecture and interior design projects, a narrative explaining how we work with our clients, and think through the design process. We cover an array of topics here: click on the categories below to focus on your particular interest, or simply read them as we wrote them. We promise no linear narrative here. Invited to Bhutan to imagine a new retreat, we suddenly realize we have a lot to offer international projects. We have Dutch and American passports that allow us to travel almost everywhere, we have extensive and very diverse experience as architects and interior designers, we have powerful and completely portable software on our laptops that allows us to set up shop anywhere there's power, and we regularly tie into powerful tools and storage in the cloud whenever we have internet access. Plus, travel completely lights us up: intellectually, emotionally, spiritually. We were in Bhutan after a rather exhausting itinerary just 5 days after first getting the invitation to discuss the project. In Bhutan, we were impressed first by the mist and the clouds. They imbued everything with a mysterious quality that suggested we were lucky for every gorgeous view we were afforded. This sense of mystery pervaded the entire trip. We were of course fascinated by the uniformity and power of the architecture, especially the Dzongs and Lahkangs of some centuries ago but also the little chortans and alters encountered by the roadside. Finally, we were confronted with a very specific jurisdictional mandate: respect this country's culture and architecture in designing this new retreat. It was difficult to understand exactly what that meant. Would there be any space for exploration or conversation? Would we simply be shoehorning new uses into old forms? Would the marriage between western sensibilities and expectations and Bhutanese culture be a one-sided union? The site was misty and remote and insulated by a magnificent and protected blue pine forest. It was damaged from grazing and once hosted a buckwheat field. When we scratched the surface of the terrain we encountered little surprises: a frog, water, abandoned implements. We started from one simple idea, that this project should offer exactly what drew visitors to Bhutan in the first place: mystery and discovery, It should pique curiosity, and appeal to the adventurer. It should reward investigation with surprise and delight. We brainstormed experiences that evoked these qualities, and they became points of reference. Lifting the cover of a new book. Opening a strange box. Walking along a curved wall. Stumbling on the unexpected. Entering a dark cave. Separating a Nesting Doll. Discovering something hidden. For example, in imagining the Villas that would hide in the trees we created a nesting doll, with a carved wooden enclosure inside a glass jewel box, and a stone chamber inside that wooden enclosure, and then not some dark dank cave of a chamber, but a beautifully sunlit room filled with glass jewels reflecting brightly so that the visitor experiences one kind of "enlightenment". When it became clear that we would host a majority of the residences in the old buckwheat field, we thought to hide them under newly planted buckwheat in newly formed terraces, drawing our inspiration from the many rice paddies we had seen in the country. We were warned that earth covered buildings would never earn Ministry approval, but we felt certain that it was appropriate here to build a garden and not a village. We felt too, that earth-covered dwellings would be a very useful tool in the jurisdictional planning toolbox. Overlooking these terraces, the main building, the lodge, started as a series of narrow volumes creating courtyards between them, and ended up as a doughnut surrounding a single courtyard punctuated by a tower or "utze" housing cafe and private apartments. We presented our first design to the Ministry of Works and Human Settlements in December, with mixed results. Earth-covered buildings and our intention to build a garden and not a village, preserving the original buckwheat field, was met with understanding and approval. Inverted roofs, elliptical shed roofs, and modern skylights were rejected. We went back to the drawing board and completed our conceptual design a few months later. Now we wait for project funding, hoping our design is powerful enough, persuasive enough, alluring enough to attract an investor. A broken leg strands us in Boston, Massachusetts for the winter, for what turns out to be a 108" spectacle of record breaking snowfall. With a good understanding of tropical and desert architecture, we use the time to ask ourselves what cold climate architecture ought to be about. We think it ought to be a combination of hibernation and celebration, offering snug retreat from the elements, but also offering the opposite: immersion in the outdoors. It seems to us, in thinking about designing a house in a cold environment, that we are exploring the territory between a bear den (very cosy and warm, but inwardly focused and both physically and emotionally buffered from the outdoors) and a bird nest (very exposed, but outwardly focused and extraordinarily panoramic). 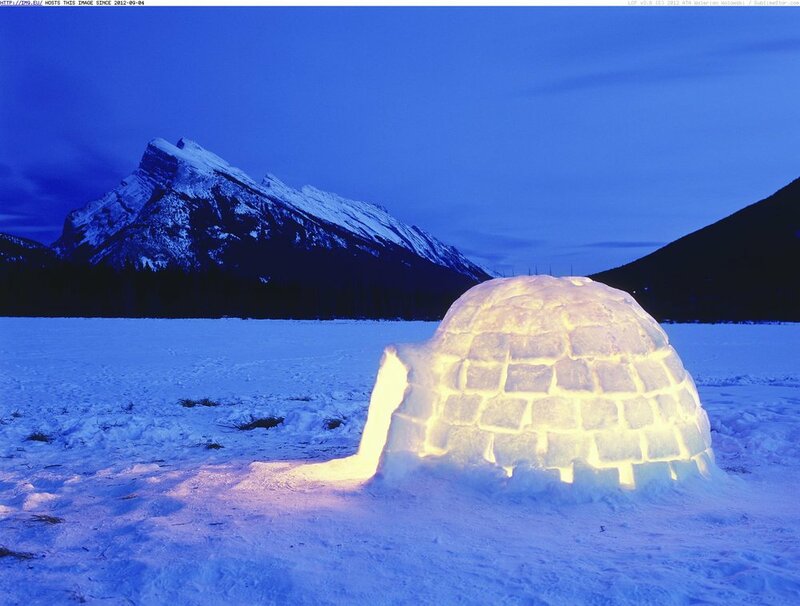 Two other references came to us in imagining a house in snow: the igloo and the "A" frame. Igloo: maximizing volume while minimizing surface area, modular in construction, the interior a simple fire circle: house reduced to heat and shelter. "A" frame: a house reduced to all roof: one big, structurally quite simple, attic. Between Igloo and "A" frame lie clues to a house. When we design a home, we seek to identify and celebrate the rituals it will host, seeking meaning by orchestrating ritual and context. This is the difference between a dull ceramic sink stuck in a vanity cabinet in a dark bathroom that has you face a small mirror on a blank wall, and a glass sink magically floating on a completely mirrored wall (see our Massachusetts house), or a sink freestanding in a room like a large fountain, facing the Pacific (see our Hawaii house). We can look at the rituals of a house, and begin to imagine contexts for them on the spectrum between den and nest. What are the rituals of a house? We cook, we eat, we sleep, we work, we relax. In cold climates, fire takes on special significance. A house offering bear den and bird nest, learning from igloo and "A" frame, celebrating fire while living in ice: this is what we set out to imagine. Den and Nest, Igloo and "A" frame, all got thrown in the soup pot, and out onto our sketchbook came 2 cones superimposed: nest carved out of den, the resulting section an "A" frame curved into a croissant. If that sounds abrupt, we will admit to a few ugly sketches in advance of these ugly sketches, and also a growing sense that simply stacking rectangles can't be the only sensible answer to most design problems, and also some curiosity about the problems that would ensue from heading down this path. Of course, it's a long road from concept to construction. This little idea, however, seemed to have both the relative simplicity and the emotional content to survive the journey. While our design in desert and tropical climates had always been more organic, with the edges deliberately blurred, it seemed entirely appropriate in extreme cold to be very precise about our envelope, while still embracing a small piece of the outdoors. It was a new way of working for us: from the outside in. Both cave and nest, inglenook and courtyard, focus on fire as an important part of the experience. Despite the triple glazing and the southern orientation and the stone floors to absorb heat and moderate internal temperatures and window blankets to minimize nighttime heat loss, it will be interesting to see how much courtyard glazing survives design development should the project go any further. We would add a canopy over the front door and work on the bunkrooms some more as well, so that they too could partake of the view. To lie in bed every night and stare up at the sky: that would be worth the additional effort. Workshops are about creativity in three dimensions. Traditionally, schools have offered workshops devoted to wood craft or metal craft or cooking or art or physics or chemistry or more recently, robotics. We imagine a far more comprehensive, collaborative venue combining all these functions. The workshop is about invention fueled by knowledge. It takes the theoretical and makes it tactile. The workshop is about innovation and problem-solving. The workshop reminds every student that they are still that creative, playful kindergarten version of themselves, but with more information and some added skills. The workshop acknowledges that the world has problems, real ones, that require solutions engaging all of the learning modalities and multiple intelligences. It invites every student to drop pretense and specialties and play with something different. It is perhaps, a vision for the real world. The flipped classroom offers an opportunity to take advantage of group intelligence and apply it to real problems. To be successful, it requires a situation room. That room would immerse participants in relevant data, offer them tools to explore solutions and ramifications, and facilitate group activity. The institutional classroom in the hands of a very enterprising teacher might look a little like this, but the key to a situation room is the way it brings information together from vast and diverse perspectives: it is a cross-pollinating, collaborative environment that transgresses departmental boundaries. A situation room will tackle problems both immediate and historic: climate change, slavery, capitalism, border security, poverty. It may devote itself to one topic for a week or a semester or a year. Its goal is problem definition, research, analysis, brainstorming, proposed action, and possible results. We fervently believe that every student in high school should be required to stand up at least once in front of the entire school and argue for something. Anything. In public. We also believe that every student should be required to participate in at least one public debate, a duel between two opposing positions requiring rhetorical skills, research and some measure of commitment and passion. The Speaker's Corner is the venue serving both goals. By institutionalizing the venue, we hope to institutionalize the activity as well, another small step in our campaign to bring Rhetoric back as an important and required skill at the high school grade levels. Holtzendorff Teaching With Technology Experimental Classroom, Clemson University, affectionately called "the Sandbox"
Maps communicate powerful messages about the world, but too often they are small and serve to distance us from the world rather than bring us closer. A change in scale, and the opportunity to walk on the earth it portrays instead of facing the image on a wall creates a far more visceral interaction with the material. We are extremely conscious of the many different projections available, and rather partial to the Peters projection over the venerable Mercator, but don't feel the details should obscure the opportunity. A large map of any projection offers a chance to demonstrate all kinds of information about different countries comparatively, stacking coins for example to demonstrate relative GDP or average income, or having students plan and execute virtual trips, or letting them study and talk about the countries they come from or visit. Too often, we encounter people with no clue about the world beyond the United States: the big map is a visceral way to connect them with the rest of the world. Nothing puts us to sleep faster than a difficult book. Studying. Trying to understand something difficult. Study circles, obliging and mentally superior friends, discussions and debates, and yes, a nice beverage or snack, these are the answer but one rarely offered at high schools. Study halls however, are a long-standing high school institution, and the library cafe is a powerful way to make them more productive. Informal, resource-rich and caffeinated or not, it beats sitting at home alone to get that homework done. For those of you scandalized by the thought of coffee stained resources, we suggest that heavily used and margin annotated and graffiti marred books have more to offer than the pristine volume nobody reads. We always appreciated the notes in our used textbooks from last year's students, and often learned a lot from them. We design modern workplaces to encourage random encounters and ad hoc creativity, but we don't encourage that behavior in our schools. We should. We teach the basics of our traditional subjects, but rarely engage in relevant, cutting edge problem solving. We should. We say we want cross-disciplinary cooperation, but don't say how or where that should happen. We should. The public kiosk is a venue suited to all these goals. Imagine it near or in the lunchroom or student union or store or teacher's and students lounge. It requires monitoring and instigation and participation from a significant cross-section of the school, but it offers the opportunity to pose and consider modern problems in modern ways. Sometimes its just a whiteboard on the outside of a conference room, instead of the inside. We believe that one extraordinarily neglected yet absolutely vital skill for success in the modern world is the ability to speak: to tell a story. That story may be a position, or it may be an explanation or it may be a dramatic narrative, but it will require speaking in a compelling fashion with care and preparation in advance. Learning to tell a story is why we believe a story booth is so important. We see it not just as a way to practice speaking skills alone, but also as a way to work privately with a mentor or teacher without embarrassment or fear. Rhetoric was once a required subject, and we are on a mission to bring it back: the Story Booth is one important tool. It will allow you to record your efforts, play it back for critique, archive it if useful, transmit it if desirable, and allow for remote communication with distant lands since the infrastructure is already there. The latter notion was explored recently in New York City, where residents were invited to connect with people in a similarly connected Story Booth in Europe and share whatever came to mind. The possibility of sharing your experience, but also of challanging preconceptions of the "Other", that distant and strange person perhaps actually no different from us, is a compelling one. SMALLab is a proponent of Embodied Learning, making learning kinesthetic, collaborative, and multimodal. It embodies (sorry) many of the characteristics we are seeking in our exploration of alternative learning environments. Here are the characteristics of a bar-restaurant that we feel offers a powerful model for learning: these spaces are Flexible, Partially Mediated Multi-format Environments focused on a Menu. Imagine a learning space that allows students to work singly or in groups. The students chose what works best for them. The curriculum (or menu) is defined at the beginning of the semester, but the pace at which students work is not and for some subjects broken down into units, even the order of the units studied may be up to the student. Thus the student can browse and select what he wants to work on, within a range taking some control of his own learning. We admit the idea is not completely new: in the late 1970s, in a tiered classroom space at Acton-Boxborough Regional High School in Acton, Massachusetts, one of us learned chemistry in exactly this fashion from a curriculum written by, among others, a very charismatic teacher named Catherine Capone. The experience has not faded from memory in 40 years. The teacher plays a vital role in this paradigm: inspiring, commenting, supporting, challenging and giving examples to both individuals and groups of students that make the material come alive. The bar component is commonplace at the Apple store, which by the way also offers tables where groups can learn about there products: it is a bar-restaurant learning space disguised as a store. How do you maximize ventilation, or improve your view, or even build a community on the water or in it? Flamingo. Even the underside of your building is vented and cooled. Building in the water isn't typically encouraged, at least in the US, but it has ancient roots and the advantages easily translate to land. A community on stilts is truly special, sitting lightly on the land, commanding the air and the breeze unencumbered by vegetation, the views so truly incredible from higher up. In the tropics, rain can be an especially powerful event. In the rainy season, the clouds build all afternoon before rapidly, massively dumping the accumulated moisture and turning exposed earth to mud. In the dry season, the storms are less predictable and the earth dryer, but the rains are no less a fact of life. In any season, because of the heat, an expansive roof with as little underneath as possible is a good solution. This is the Butterfly. Our design for Hula Dog Farm on the Big Island of Hawai'i is a Butterfly, earth and water and air free to flow under and through, but the very big roof keeping the house dry and comfortable all year long. Take a look at hundreds of tropical buildings, as we have, and you begin to see a theme: flow, air flow, and screens and lattice and expansive porches that filter out the insects but let the air through. It reminded us of fish and gills and the way gills pull the oxygen out of the flow of water, and a comment we once heard but never confirmed that a shark will die if it doesn't maintain the flow by moving. The metaphor isn't exact (houses filter out the (undesirable) insects and use the airflow, fish filter out the (desirable) oxygen and eject the waterflow), but we didn't really think that through until after the label had already firmly stuck. That big, beautiful shell is a terrific mediator between harsh exterior circumstances and the delicate animal within, and that vaulted space would be amazing magnified 100x. We think of Arcosanti as a tortoise: huge concrete vaults poured on carefully sculpted hills of sand, and then dug out to create beautiful spaces. It also inspired a house we designed for a friend in Algeria, dug into a berm, covered with dirt, parts emerging from under the shell and stabilizing the shifting sands. There aren't a lot of programs suited to strictly linear configurations, but the repetitive structure, the possibility of modulating the height and width, and the idea of a building that coils and flows are intriguing. What interests us most, however, is hanging on to the shed skin: a second skin. The temperature difference between shaded and unshaded surfaces can get as high as 50 degrees Fahrenheit or more, reinforcing what we already know: it's more comfortable in the shade, at least when the ambient temperature gets above 80 or so here in the dry desert. Imagine a building with a second skin shading it in the summer only, shedding it in the winter when we need the heat even here: this strikes us as a model worth consideration. The Saguaro elegantly combines a pleated exterior that casts a lot of shade on itself, with a woven skeleton of great strength. The skeleton reminded us of the exterior structure of the twin Trade Center towers that fell on 9/11, and possibly of the Bird's Nest stadium from the Olympics in China, and a bit as well of a building on the High Line in New York City by Neil Denari. Pleating a building skin is a bit fashionable, but we always wonder if its pure rhetoric and no substance. Why pleat? To give strength to a thin material or structure, to add scale to a facade that might otherwise feel abstract and scaleless, and from the saguaro this idea: to cast shadow and keep the sun off yourself. Digging down into the cool, dry earth and hiding from the sun, a strategy that served us well on a hike through the Grand Canyon when we ran out of water once (not a proud moment), but not immediately what you would imagine for a building that after all, usually benefits from windows and a view. Nonetheless, imagining ant excavations as courtyards and lightwells suggested to us a useful line of investigation, especially for programs where daylight and views are less important. Our design for the Grand Eqyptian Museum, for example, was based on anthills, as is the Museum of the Sahara currently in design. For the latter, we dig courtyards down as you would to find water, creating outdoor spaces around fountains and pools, gathering galleries around these outdoor spaces and moving gathering spaces and offices up so that they do benefit from the available views. Nothing made me more bitter about school than lectures with the lights on. Lectures with the lights off simply put me to sleep. Neither contributed much to my education. The flipped classroom is the answer. Instead of doing individual work (listening and taking notes) in a group setting, the flipped classroom gives students group work (projects, discussions, games) in a group setting. The opportunity when we think about how to make the classroom experience truly meaningful: the classroom itself is no longer bound by the lecture model or configuration. No sage on the stage means no stage: the classroom is liberated from historic models and available for complete reconsideration. The question becomes: what can be done to make the classroom experience as visceral, as memorable, as impactful as possible? With a flipped classroom model, we can completely reconceive the classroom, stop thinking about it as a "room", and focus on environments that support and enhance profound learning experience.